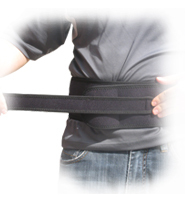 The BFST® and ColdCure® Hip Wraps are designed to treat any area of your hip. They can easily be applied to the affected area and adjusted to fit your shape using the attached straps. The ColdCure® Hip Wrap provides superior relief from pain and swelling, while the BFST® Hip Wrap works to accelerate the healing process by stimulating additional blood flow. You can also wear the wraps when you're not doing a treatment. 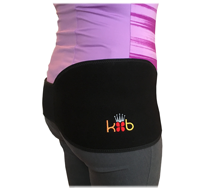 This will provide your hip with light support and compression during the day's activities. 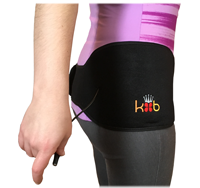 Whether you are using the King Brand® ColdCure® or BFST® Back/Hip Wrap, they can easily be applied to the injured area. The high quality neoprene wrap and Velcro® closure allow for a custom fit for each individual, regardless of size or location of injury. Follow the guide below to find the exact spot you want to treat. Hip Pointer - A Hip Pointer Injury is also known as Iliac Crest Pain. The pain will be concentrated around the upper portion of the hip bone and pelvis area (this is called the Iliac Crest). Hip Labrum Tear - Your Hip Labrum is located in the space where the thighbone inserts into the socket of the hip joint. The pain will present in the front of the hip or groin area. Hip Bursitis - There are 4 bursae (fluid-filled sacs) on each side of your hip. The area of pain depends on which bursa is inflamed. Trochanteric Bursitis is the most common type of Hip Bursitis. Pain associated with Trochanteric Bursitis is felt on the outside of the hip, the thigh and the buttock area. Hip Flexor Injury - A Hip Flexor Injury affects one or more muscles in the Hip Flexor Group, located in the front of the hip. The pain is often felt close to your groin area. Hip Pain & Strains - Position the wrap so the treatment area is covering the painful or strained part of your hip, whether it's the side, front or back of your hip. Piriformis Syndrome - This affects the Piriformis Muscle, which is located in the buttocks. The pain often radiates from the buttocks down the leg. If you have a waist that measures above 55", the Accessory Strap can provide a more customized fit for the BFST® and ColdCure® Hip Wraps. The strap provides up to 11+ inches of extension so you can use as much or as little extension as you need. 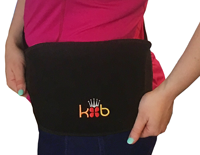 We all come in different shapes and sizes and this strap will allow you to increase the size of your Hip Wrap to achieve the best possible fit and treatment. Just attach one end of the Accessory Strap to one of the Hip Wrap straps and pull it around your front. Attach the other end of the Accessory Strap to the other Hip Wrap strap. Adjust to your desired fit. The purchase of every BFST® and ColdCure® Wrap comes included with the free professional consulting services of our King Brand® Advisors. One of our Advisors will contact you 4-5 days after your order has been delivered to see how your treatments are going and answer any questions you may have. Our Advisors are highly knowledgeable when it comes to treating hip injuries and conditions. They have also been thoroughly trained on BFST® and ColdCure® technology and treatments. Our Advisors truly care about your recovery. They can even help you develop a personalized treatment plan. 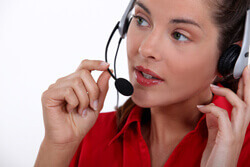 While one of our Advisors will follow-up with you directly, you are welcome to contact us if you need any assistance. We're here for you every step of the way. Note from KB WebMaster - The text below is primarily intended to assist with Google properly classifying this page content. To learn more about our products please visit our website.<br>Common hip injuries and conditions include Hip Bursitis, Hip Flexor Injuries, Hip Pain and Strains, Hip Pointer Injuries, Iliac Crest Pain, Piriformis Syndrome and Hip Labrum Tears. Hip injuries and conditions plague many people. A bad hip injury causes hip pain. There are many symptoms of hip pain caused by hip injuries and hip conditions. Treatment for a hip injury will cause your hip pain to improve and your hip injury to heal. There's no doubt that to heal hip injuries quickly you need BFST treatments. ColdCure will help with hip pain. You can cure hip pain and a hip injury with BFST and ColdCure technology. Some hip injuries require surgery. This heals the injured hip but the pain in your hip after surgery can be severe. The best hip injury treatment is BFST. The best hip pain treatment is ColdCure. These wraps are incredible. They feel comfortable. They work. So, if you want to heal your injured hip quickly, you need BFST. If you want to treat hip pain you need ColdCure. Hip injury symptoms are hip pain and swelling. A sore hip can be helped with hip exercises although hip exercises won't cure all hip injuries.